The purpose of this paper/presentation is to highlight the findings of 18 months of research, from which selected results have previously been published in the International Journal of Vehicle Structures and Systems as well as a proposed publication in the International Journal of Crashworthiness. This research was carried out by means of a series of topology optimisation studies in order to aid the design process of a Body In White (BIW) for a Hybrid Electrical Vehicle (HEV). These optimisation studies were conducted using Altair HyperWorks. The overall purpose of the optimisation study was to minimise the BIW mass whilst subjected to multiple crash scenarios including: high speed front impact (ODB), side impact, pole impact, high speed rear impact, low speed rear impact in addition to a roof crush scenario. 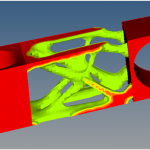 In order to achieve this goal, Finite Element (FE) topology optimisation was employed whilst utilising equivalent linear static load cases. The initial stages of the overall study was aimed at identifying general trends and establishing modelling rules for usage throughout the remaining optimisation study. This included aspects such as the effects of the type of boundary conditions used, i.e. inertia relief and Single Point Constraints (SPC), the size of the load application areas, including /excluding elements from the design volume as well as the effects of scaling the external dimensions of the design volume. Based upon the findings of the initial study the main part of the optimisation study was aimed at determining the ideal locations for key components for the HEV; these were: a battery box, a combined range extender / fuel tank, an electric motor and an alternator in order to minimise the BIW mass while meeting the structural (crash) performance requirements. The main part of the optimisation study also contained a series of sub-studies exposing the sensitivity of the models/results with respect to e.g. minor variations of the force application angles as well as exploring the potential of utilising the structural integrity of key components such as the battery box in order to achieve a further reduction in BIW mass. The variation of HEV roof design has also been investigated whilst considering proposed changes to the roof crush loading procedures to the FMVSS216 standard; which suggested a significantly different roof structure topology when compared to most modern day fossil fuelled vehicles.